"In these days of war and strife, the orphans of Skyrim are the true victims. Many have no one left to turn to, and face a life of hard labor, poverty, and misery.If you could provide a stable home for one of these innocent children, please, consider adoption. Take in someone closer to home, you can make a difference in a child's life." 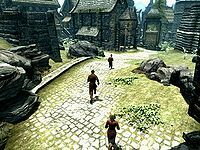 If you have Hearthfire installed, you can adopt up to two children in Skyrim. You do not have to be married to adopt. Children can only be adopted if you have a child's bedroom in your house or extra beds and cotainers in your self-built houses. Once you have adopted a child, they will live in your house and call you Papa/Mama. You may have various interaction with your children, such as playing games, giving a gift and asking them to do some chores. They will also have some unique activities, such as keeping a pet, giving you a gift, asking you for an allowance and playing games with other children in the city. You can please your children in many ways and they will reward you with the blessing The Gift of Charity. If you sleep in the same house as your children, you receive the Mother's Love or Father's Love bonus (unless you are a werewolf), which makes healing spells and potions more effective. "I'm the Dragonborn." "What? If you aren't going to be... wait. Shor, you're serious! Well, I... all right then." "I'm the Harbinger of the Companions." "I'm the Archmage of the College of Winterhold." "I'm an Assassin." "What? What kind of a joke is this? Look, don't waste my time. Come back when you're ready to discuss this for real." She will then ask where your child will be living. If you have an appropriate home—including a child's bedroom—a list of eligible homes will appear. Choose one, and she'll congratulate you: "Very well. That's all I need from you. Congratulations! I think you'll make an excellent parent. Go meet the children and decide who you'd like to adopt. Once you've made a decision, I'll collect their things and be sure they make it over to your house." After she said so, the quest will be finished and removed from your journal. If you linger or approach her again, she'll encourage you "Go on, speak to the children! I'm sure they're eager to meet you." However, if you do not have the required property and furnishing options for a child, she will tell you "...Look, let's be realistic. You're an adventurer. It's not exactly a safe or reliable profession. I need to be sure your child will have a safe, stable home to grow up in. Show me that you can support a child. Buy a house. Furnish it. Then come back and we'll talk." If you linger or approach her again, she'll reiterate this with, "I'm sorry. Until you own a home with a room for your children, I can't allow you to adopt anyone." From here, you may go speak to the orphans living in the orphanage, and ask them to tell you about themselves, or offer to adopt them. You can also leave the orphanage and find any other children in some cities and towns to adopt. In order to adopt a child, you must own a house with child's bedroom. Talk to a steward and purchase the child's bedroom upgrades. All three player-built homes have the same options for a child's room. After building the Main Hall, you must add 1-2 single beds (depending on how many children you wish to adopt) and the dresser between them. It is not necessary to build the Bedrooms addition on the west wing of your home; however, if you do build it, you must build both the child's beds and child's chests in order to adopt even one child; your children will then move into the bedroom. Child's Bed: Your children will sleep on it during the night. Child's Chest: Your children may collect various things and store them in this chest. Their older weapons, clothes and dolls will be kept in it too, if you give them a new one. They will restock it every few days. However, the original contents won't disappear. It will be empty if you haven't adopted any children. Child's Practice Dummy: If you give them a Wooden Sword or a dagger, they may practice with it every morning. When speaking to orphans that you encounter, you have an opportunity to learn about them via dialogue, then speak to them about adoption. Adoption dialogue is generally the same for children in Riften's orphanage and homeless orphans found elsewhere, the only notable difference being that you cannot speak to the children in the orphanage about adoption if you do not have an eligible home. Player: "I could adopt you, if you want." Child: "Really? Do you... do you have a place I could live?" Player: "I have a house, but not room for you." Child: "...Oh well. Thanks anyway, I guess." Child: "...Oh well. Thanks anyway, I suppose." Player: "Yes, I've got a house in <Alias=Location>." Child: "Oh, wow! Are you... are you sure? You really wouldn't mind?" Boy: "Yea! Thanks! I promise I'll be the best daughter ever! I need to get my things and say goodbye to everyone. I'll meet you at home. Thanks! Thanks so much!" Girl: "Really? You mean it? Wow, thanks! I promise, I won't be any trouble at all! Just... just let me get my things and say goodbye to everyone. I'll meet you at home. Thanks! Thanks again!" If you linger, you may hear the child exclaim, "I can't wait!" If you are adopting from the orphanage and speak with Constance again after choosing a child to adopt, she will tell you "Congratulations. I hope you have a wonderful life together." If you are speaking to a child about adoption after having already adopted one, you will not have the option of choosing from all eligible homes, instead being forced to choose the same home your first child lives in. Here is a list of children that can be adopted without any other limits. Blaise (HF) Breton Male Katla's Farm Solitude If you ask him how he likes the farm, he'll tell you "I hate it. Everyone feels sorry for me, so they don't treat me too bad, but..." If you ask him to elaborate, he'll explain "Both my parents were in the Legion. There was... an ambush. Katla said she could feed me if I could make myself useful. I take care of the animals, run errands, that kind of thing. I guess it could be worse. But... I'm sick of sleeping outside with the horses. I want a real home, real parents. Not... this." Lucia (HF) Imperial Female None Whiterun If you give her 1 gold, she'll graciously reply "Oh, thank you! Divines bless your kind heart." You can ask her why she's begging, and she will explain "It's... it's what Brenuin said I should do. He's the only one that's been nice to me since... since mama..." She will pause briefly, then continue, "...Since she died. My aunt and uncle took over our farm and threw me out. Said I wasn't good for anything. I wound up here, but... I I don't know what to do. I miss her so much..."
Francois Beaufort Imperial Male Honorhall Orphanage Riften If you ask him to tell you about himself, he will say "My mother and father brought me here a year ago. They said they'd be back soon, but... they're awfully late. I... I guess it would be all right if you want to adopt me. At least until my real parents get back." 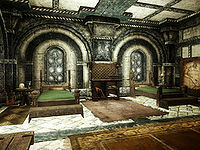 Samuel Imperial Male Honorhall Orphanage Riften If you ask him to tell you about himself, he will say "Name's Samuel. Never met my parents. Grelod said my mother worked here at the Orphanage, but she died when I was born. Constance and the others are nice enough, but I... I want to have a real family." 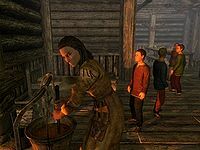 Runa Fair-Shield Nord Female Honorhall Orphanage Riften If you ask her to tell you about herself, she will say "I've been the only girl here since forever. The boys pick on me, and they make me do all the chores. You want to adopt one of us, right? I'm strong, I'm fast, I'm smart, I can do anything better than them. Come on, pick me? Please?" 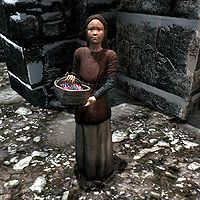 Sofie (HF) Nord Female None Windhelm She may approach you and ask "Would you like to buy some flowers? Please?" If you inquire about her parents, she'll inform you "They... they're dead. My mama died when I was little... I... I don't remember her very well. My father was a Stormcloak soldier. One day, he left and... didn't come back. I'm all alone... I... I try to sell flowers so I can buy food. It's not much but... what else can I do?" Hroar Nord Male Honorhall Orphanage Riften If you ask him to tell you about himself, he will say "I'm Hroar. You know, like the sound the lion makes? That's what my mother used to say. I want to be big and strong like a lion, too. Someday." Alesan (HF) Redguard Male None Dawnstar If you ask why he's in a hurry, he'll answer "I'm running food and supplies to the miners. Don't pay much, but they let me sleep by the fire in the inn most nights." If you inquire about his parents, he'll sadly inform you "They're... dead. My pa was a sailor. Took me with him on his last trip. After he got sick, they... put us off here and left without us. He... died a few days later. I've tried to make do since then, but... it's been hard. Real hard." Here is another list of children that can be adopted if their parent(s) are killed. (They will be moved to the Honorhall Orphanage in Riften if this occurs.) Note that some parents may be essential and unkillable until after certain related quests have been completed. Your adopted children will live in your house. They may have various activities during the day and sleep on their own beds at night. They might be seen doing chores, playing with a pet/toy, practicing with dummy, eating, singing, playing music in the house. If your children are living in a city, they will often play games together with other children. Outside your self-built houses, they may spend time enjoying the view of surroundings. I've got something for you, (Name). - You may give your child a gift, such as sweets, apples, clothing, daggers, dolls (girls only) or wooden swords. Thay will thank you and reward you with the blessing The Gift of Charity. If you give they a dagger or a wooden sword, they will be extremely excited and reply with "This is great! Wow, thanks!" Their older weapons, clothes and dolls will be kept in the child's chest, if they get a new one. They prefer to use the new weopon regardless of its quality. If you give your child a piece of new clothes, a copy of his/her very original clothes will appear in the chest. Let's play a game. - You may put forward a proposal to play a game. Your child will be quite happy and ask you what do you want to play. You can choose to play hide-and-seek or play tag. You may also change your mind and cancel the game. If you wake them up to play a game, they may doubt "Wha? But... but it's dark out. Is it... really okay?". If you choose to play with them, a miscellaneous quest will be added into your journal. The quest mark will help you fulfill the game without much trouble. If your children are living in a city, other children in the street will participant in the game too. Okay! You stand right there and count to 10... no peeking! Ready? ...Go! 10... 9... 8... 7... 6... 5... 4... 3... 2... 1... Prepared or not, I'm coming! This is a good hiding spot. She/He'll never find me here. I found you! Na na na, na na na! Go play outside, (Name). - If your child is staying in the house, you may ask him/her to play outside. Your child may refuse to do so, you may insist your idea or allow him/her to stay at home. Time to go home, (Name). - If your child is staying outside the house, you may ask him/her to go home. Your child may refuse to do so, you may insist your idea or allow him/her to play outside. Go do your chores, (Name). - You can ask your child to do some chores, they will begin to sweep the floor unwillingly. It's time for bed, (Name). - You may ask your child to go to bed in the evening. They may claim "Aww... come on. Just a few more minutes? Plaese?" or "But it's not even dark yet!" You may choose to insist your decision or allow them to stay up. It's time for us to move. - You can decide which house should your child live in, if your have more than one houses available. You may ask them to move to a new house with this option. Even if you don't have another house available, you may still tell them to do so, but they will reply with "Aww... stop teasing me!". Did you really build this house all by yourself? Wow! You can trigger some random events with your adopted children, as well as any other children. During the day, you may meet up with your children and they will ask you "Hey, Ma/Pa! You want to play a game with us?" You can choose from "Sure. What game do you want to play?" and "Actually, I can't stop to play games right now." If you use magic near children, they may ask you to make them invisible. If you lie to them and claim they are invisible now. They will try to surprise an adult. If you come back to your house and meet up with your child after a long time, they will approach you and have some random interaction. New interaction can be triggered after at least 24 hours in-game. You may find their pets at home and they will ask your permission for keeping it. "Look, Papa/Mama! I have a new friend!" "Could I keep him? Please?" You may remind him/her "All right. But you're responsible for him." and allow them to keep it. At the same time, you may tell them "No. Now get it out of here." or "Absolutely not. No pets. Ever." The latter option will cause them not to ask for a pet for at least 15 days. You can give your permission "Sure. When I don't need him, he can stay with you." If you tell your dog follower to go home, he will return to the house where your children live. You can also choose "Not right now." or "No. No pets. Ever." to refuse them. Their pets will follow their young master at home and rarely go outside the house. Killing your child's pet will cause your child to stop speaking to you, saying "Why...why did you do that? ", "Leave me alone!" or "I'll never speak to you again!" If their pet die, they may pet a new creature and ask your permission again. If you tell them "No, stop pestering me. ", they will not ask for a gift for at least 15 days. Asking for an allowance - Your adopted children may ask you for an allowance. "Could you give me an allowance?" "Could I get a few gold to spend? Plaese?" Sorry, I can't afford it right now. I understand. ...Sorry. Here's... 5 gold. All right. Thanks. Here's 10 gold. Thanks, pa/ma! Sure. Here's 25 gold. Thanks! How about 100 gold? You're the best! Thanks! No problem. Here's 500 gold. You're the best! Thanks! Sure, whatever you want, 1000 gold? Wha... seriously? No way... With this, I... I could buy everything in the market! Wow! Thanks! Games - Your children may invite you to play a game. You can decide whether or not play with them. You can also remind them "Isn't it past your bedtime? ", if the time is late. Giving a gift - Your child may have a gift for you,, including potions, ingredients, soul gems, gems, clothes, jewelry, and ores. "You're back! I got you a present, Mama/Papa! I hope you like it!" "You're back! Hey, I got you something. Hope you like it!" If you have Dragonborn installed, you may obtain some new ingredients without setting foot on Solstheim. Green Robes and Red Robes can only received as a gift from adopted children. Quarrels - If you have adopted two children, they may be seen having a quarrel with each other. "Well, you smell like a Hagraven. And you look like one, too!" "You... you take that back! Waaaaaaah..."
"Oh yeah? Well, I've seen mudcrabs that're smarter than you!" "Grr... I'm gonna get you for that!" You may interrupt them at any points before they finish the quarrel. You can educate them "Enough. (Name), go to your room." or "Cut it out, both of you." They'll never do it again, if you stop them in time in the first few times. If you attack your child, they will warn you at first. If you keep hurting them, they'll eventually turn hostile to you and refuse to speak to you. You mind swinging that somewhere else? Don't do that again. Last warning. Once more and I'm going to have to kill you. I didn't think you had the stomach for it. If you would like to adopt an orphan from the Orphanage, speak to Constance Michel. _BYOH\LoadsScreens\​LoadScreenAdoptionGirl01.nif Constance Michel is not dead, completed Innocence Lost, adopted less than 2 children, 2% chance. You can adopt up to two children, if you own a home with room for them to stay in. _BYOH\LoadsScreens\​LoadScreenAdoptionBoy01.nif Adopted less than 2 children, 2% chance. You can find, make, or buy a variety of gifts for your children, including toys, clothing, and sweets. _BYOH\LoadsScreens\​LoadScreenAdoptionGirl01.nif Adopted a child, 2% chance. If giving your adopted children clothing, it may cause their torso to turn invisible. ? You may not be able to adopt children after failing to have a room for them the first time. ? You may actually receive nothing when your children have a gift for you. ? Your personal steward and bard may decide to sleep in the beds for children, making it impossible to adopt. ? Your adopted child may not have the dialogue option to keep a dog which has followed you home as a pet, or may say something like "Stupid dog." ? Fast-traveling and returning might open this option. Even after accepting a canine, the whole family may constantly say "Stupid dog." Fast-travel does not resolve this. After telling adopted children to go to bed, they will instead appear to sit on thin air and never perform any other animations. ? Can be fixed by simply saving and reloading. Your adopted child may continue to say that they need to gather their things and bid farewell to the other children, even after they have arrived at your house. No other dialogue is possible. ? This can be fixed by moving your family to a new home. You need to have a 2nd suitable house prepared. If you have a spouse and child(ren) and try to move houses, then the children will but the spouse will not. ? Return to the previous house and ask the spouse to move again. When initiating dialogue with any girls after they are been adopted, they may say "I like it here. The tree in the park is so pretty!" even if they aren't living with you in Whiterun. ? This page was last modified on 11 May 2013, at 00:28.